Forgive me for veering off on a tangent in the first sentence of the post, but I just can’t help myself. To say that I am proud of Canada, and my countrymen and women, would be an understatement. With the sound win by the Canadian women’s hockey team, Canada broke its previous winter Olympics gold medal count record. But it’s not just about the medals. Rather, it is the spirit with which the Canadian athletes and hometown fans celebrate the honor. As the Canadian maple leaf was hoisted high above the hockey rink, every Canuck in the arena sang the national anthem as though their lives depended on it – with exuberance, with jubilance, and with heartfelt pride. And me? Well, I simply could not stop smiling through my joyful tears (yes, I cry at those Proctor & Gamble ads, too). What do calzones have to do with the winter Olympics? Absolutely nothing, except that we were eating them as the Canadian women skated to victory. 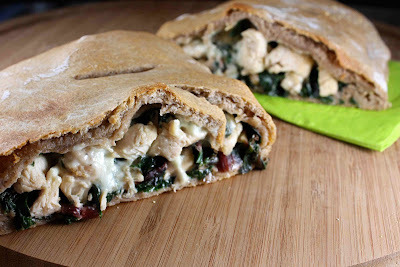 With a whole wheat crust, sauteed chicken, slightly charred chard (yes, I am proud of myself for that one), and savory Gorgonzola, this calzone makes for a healthy and substantial meal. Preheat oven to 450 degrees F. Place a pizza baking stone on a rack in the lower third of the oven and heat for 30 minutes. On a rack underneath or above the pizza stone (arranged so that it does not interfere with the pizza stone and calzone), place an empty metal broiler rack. 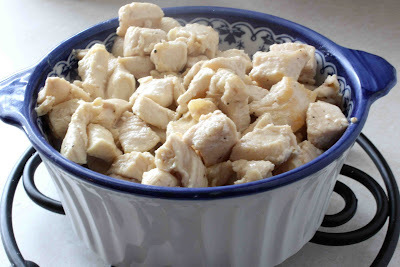 Cut 1 skinless, boneless chicken breast into 1/2-inch pieces. Heat 1 teaspoon olive oil in a large skillet set over medium-high heat. Add the chicken, season with 1/2 teaspoon salt and 1/2 teaspoon freshly ground black pepper, and cook until the chicken is barely cooked. The chicken will cook further when baked in the calzone, so you don’t want to overcook it at this stage. Set the chicken aside. 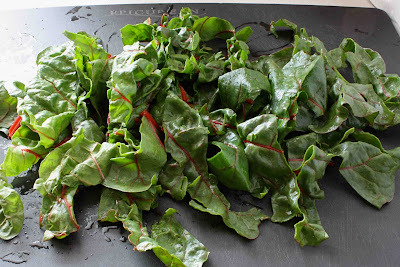 Using a 1-pound bunch of red chard, thinly slice the leaves crosswise and discard the stems. Heat 2 teaspoons olive oil in the same large skillet over medium heat. Add the chard, season with 1/4 teaspoon each of salt and pepper, and cook until the chard is just wilted, 2 to 3 minutes. For the dough, I used 1 pound of Zoe Francois and Jeff Hertzberg’s master recipe from their new book, Healthy Bread in Five Minutes a Day. . If using this recipe, make the dough, refrigerate it, and then cut off 1 pound (about the size of a large grapefruit) of the dough. It is not necessary to let the dough rise for 90 minutes on the pizza peel when making calzones, flatbreads, and pizzas. This calzone would also work well using my pizza crust recipe. It requires some kneading, but uses ingredients that are found in most pantries. On a well-floured surface, roll the dough into a 1/8-inch thick circle. 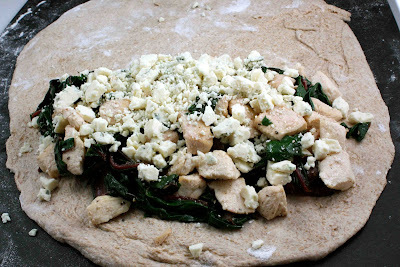 Place the chicken, chard, and 2 ounces crumbled Gorgonzola cheese on half of the dough. Brush the edges with water, fold the unfilled portion of dough over the filling, and press to seal the edges. Using your hands, carefully transfer the calzone to a pizza peel covered in cornmeal. Brush the surface of the calzone with water. Cut three slits in the dough, making sure the cuts go all the way through the top layer of dough. With a quick jerk, slide the calzone onto the baking stone. Quickly pour 1 cup of hot water into the broiler rack and close the oven door immediately. Bake for about 25 minutes, or until the crust is golden brown. Let rest for about 5 minutes before slicing. Serve. Heat 1 teaspoon olive oil in a large skillet set over medium-high heat. Add the chicken, season with 1/2 teaspoon salt and 1/2 teaspoon freshly ground black pepper, and cook until the chicken is barely cooked. The chicken will cook further when baked in the calzone, so you don’t want to overcook it at this stage. Set the chicken aside. For the dough, I used 1 pound of Zoe Francois and Jeff Hertzberg’s master recipe from their new book, Healthy Bread in Five Minutes a Day. If using this recipe, make the dough, refrigerate it, and then cut off 1 pound (about the size of a large grapefruit) of the dough. It is not necessary to let the dough rise for 90 minutes on the pizza peel when making calzones, flatbreads, and pizzas. This calzone would also work well using my pizza crust recipe. It requires some kneading, but uses ingredients that are found in most pantries. On a well-floured surface, roll the dough into a 1/8-inch thick circle. Place the chicken, chard, and Gorgonzola cheese on half of the dough. Brush the edges with water, fold the unfilled portion of dough over the filling, and press to seal the edges. goodness, this calzone looks mighty healthy (minus the cheese, i guess). but nicely done. we did a calzone once but we didnt add enough cheeze so it didn't ooze out as nicely as yours. did you notice the men's hockey team sitting there totally unresponsive? I was shocked and thought they were downright rude…. buggers…. the least they could have done was to smile or clap a bit or something…but, nope… not them. Then again…maybe they are afraid they won't be able to pull off their win…. These calzones are fantastic Dara. Love the flavors and the combinations. I just love blue cheese. This calzone looks amazing! I have mastered chicken rolls, so now I think I need to try calzones. I have made them in the past but haven't used water to keep it closed so it turned into a very tasty disaster! I need to get that book, I've heard great things about it. This calzone sounds fabulous with gorgonzola! My husband would absolutely love it! Congrats to your team! That is so exciting. Equally exciting is the look of this calzone… great job here. I bet it tastes fab! 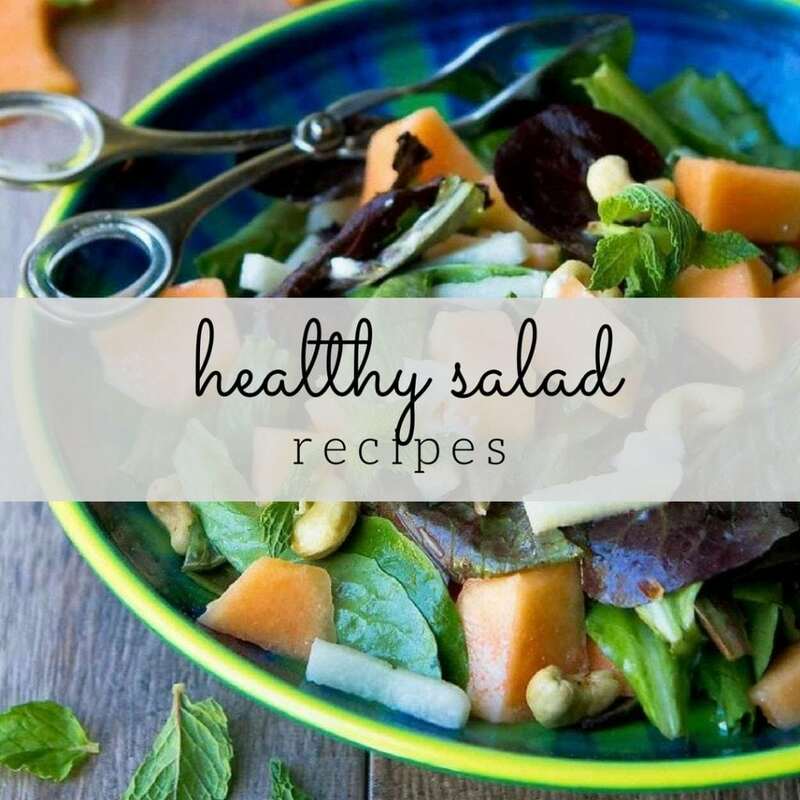 Tasty ingredients and well balanced meal, love it! I love a good calzone and yours is so grand with the cheese and chicken… and melty and substantial -perfect fare for these winter games. I am thoroughly enjoying the games – don't keep a medal count – just love when someone does something especially well done. And now yearning for Vancouver. I loooove calzones. Looks great! Way to go Canadians! The calzone looks delicious! I'm guessing that's Swiss chard. I will have to try calzones now! Didn't know you were Canadian! well they sure do how to handle ice and snow. Your calzone is a great way to celebrate! very appetizing! Ohhhh the gorgonzola! 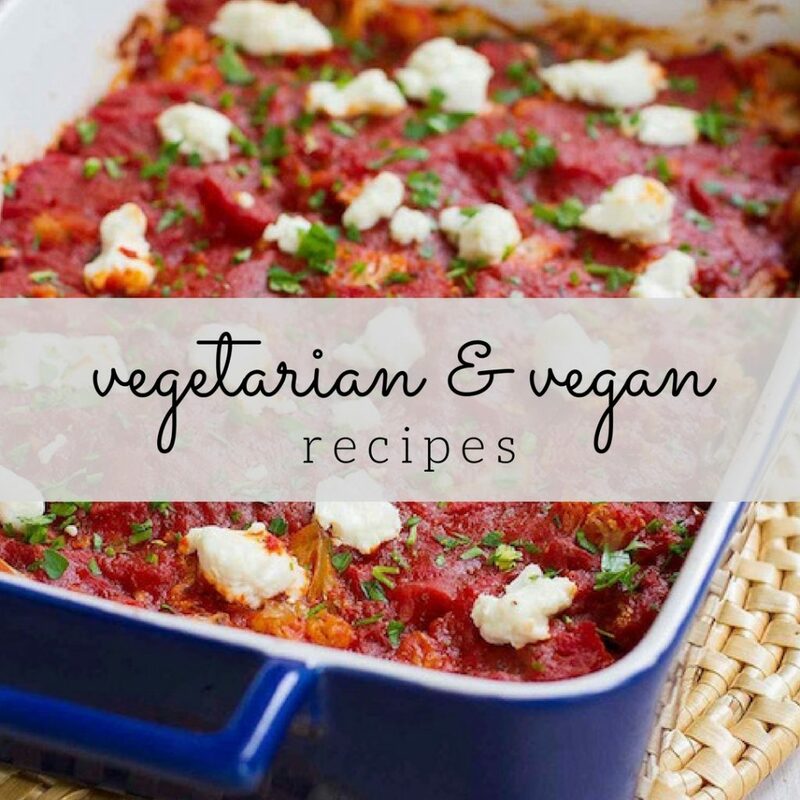 Great recipe…I'd make it with chicken for Jens…and maybe just a few extra veggies for me. Either way, its over the top! And the calzones look fantastic too. What a great healthy Calzone! It's a nice way to sneak in more veggies! The whole wheat calzones are healthy and yummy. I'd like to have one for my daily lunch. I love calzones and I have never attempted to make them healthy! 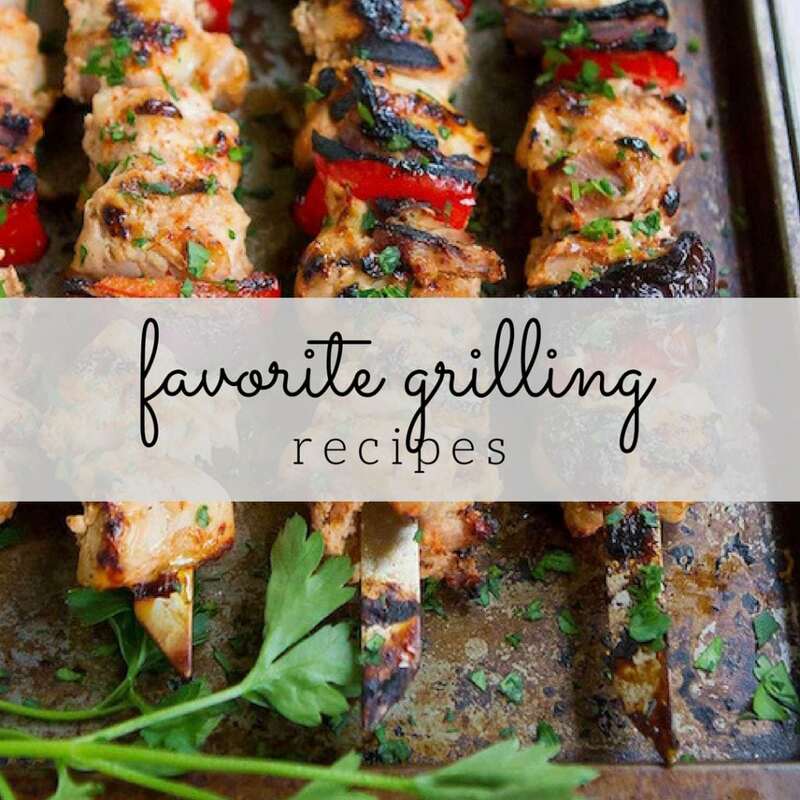 Your recipe looks fabulous! You should be proud of Canada! They did amazing. Also I love your calzones, as chard is a fave of mine. This calzone looks perfect and yummy!! Oh this looks so yummy! You have such a nice site, I'm so happy I found it! Have a great week! I love that you've used whole wheat it this calzone. I can't wait to try it. Congrats on the hockey win yesterday! So fitting for the closing day of the olympics in Canada. Heartfelt singing in the stands had me tearing up too! This calzone is worth cheering for as well. Oh my heavens — you had me at "gorgonzola." Fabulous!! I just made Meatball and Pepperoni Calzone. I am a huge fan of any form of stromboli or calzone. Mmm, delicious and healthy…my kind of meal! Healthy and filling, too. What a great combination of flavors in the filling! I am a huge fan of calzones. This looks so good, and I love the fillings. Would make for a perfect dinner. I love calzones, these look great! I would love to have one of these calzones for dinner tonight…you are making my stomach grumble. This looks delicious!